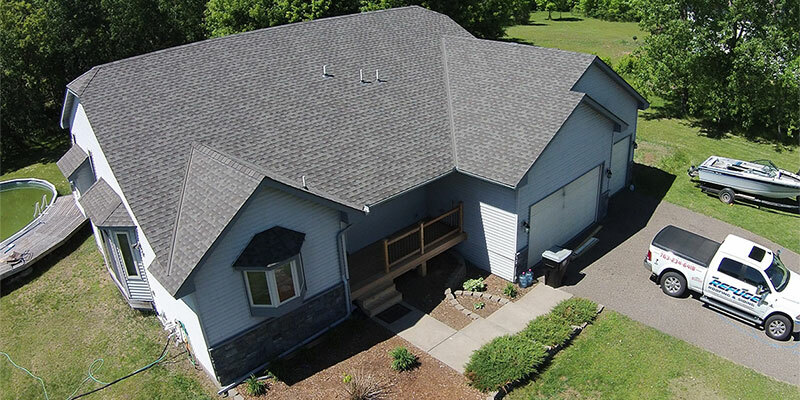 Refuge Roofing & Siding, LLC is a fully licensed and insured local general contractor based in Oak Grove, MN that primarily specializes in residential and commercial roofing, siding, windows, gutters and storm/insurance restoration work, i.e. wind, hail, fire and water. 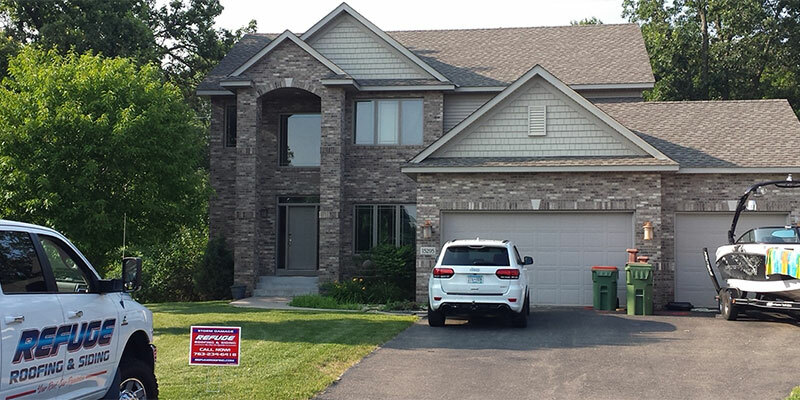 Refuge Roofing & Siding services are offered in the Minnesota cities of Oak Grove, Princeton, Cambridge, North Branch, East Bethel, Elk River, Ham Lake, Nowthen, Andover, Fridley, Cedar, Zimmerman, Forest Lake and the surrounding Minneapolis area. We grind it out with all major insurance companies to restore storm damaged homes and businesses in Minnesota to their original state or BETTER! We take the stress and hassle out of dealing with the insurance company and correctly account for all household damages! We will meet your insurance adjuster on-site whether it be at your home or place of business and assist in accounting for any and all damaged property pertaining to your roofing, siding, windows and gutter systems. This insures that no stone is left unturned and nothing gets missed! With the variations of our Minnesota weather, keeping up on home repair can be difficult. Our skilled contractors understand what the drastic temperatures are like and what they do to a home. We are properly certified for all your exterior remodeling or contracting needs. When it comes time to find a local roofing, siding, insulation and gutter system contractor give us a call. We are GAF certified and qualified to handle any of your home improvement needs. Being GAF Certified means we are properly licensed, insured, continuing constant training, and have a great reputation. Our warranties for unforeseen circumstances are off the charts when protecting you and your home. Our trained contractors use GAF’s Weather Stopper® 3-Part Roof Protection System, top of the line technology when it comes to roofing materials. When looking to upgrade your home or repair storm damage, look for a contractor you can trust. Contact Refuge Roofing & Siding today for a professional project manager to go over some options with you! 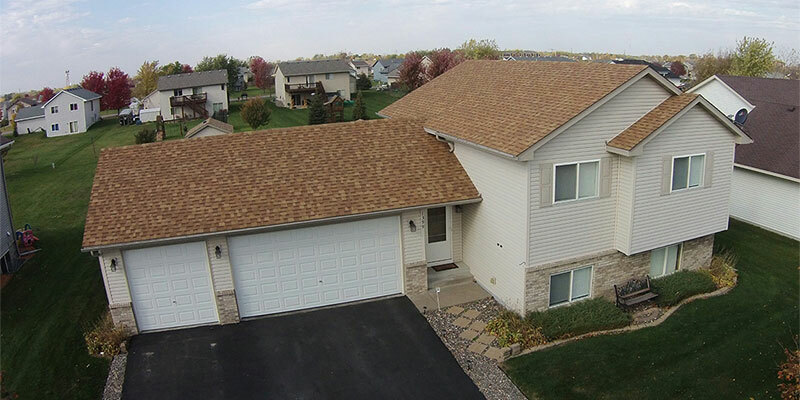 Call (651) PRO-ROOF or click the button below to send us an email to get the process started. Our warranties for unforeseen circumstances are off the charts when protecting you and your home. Our trained contractors use GAF’s Weather Stopper® 3-Part Roof Protection System, top of the line technology when it comes to roofing materials. 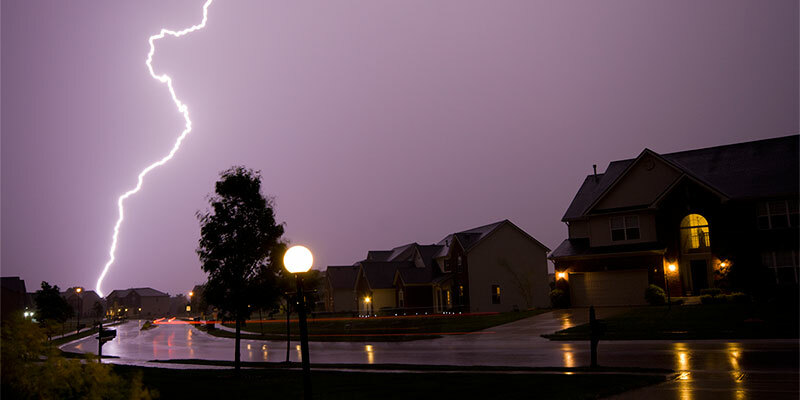 When looking to upgrade your home or repair storm damage, look for a contractor you can trust. Call Refuge Roofing & Siding today for a professional project manager to go over some options with you! Businesses need attention just as much as your home. Keeping up with additional property is a very time consuming process. You have a Minnesota contractor you can trust in your corner. From dealing with the insurance company, to the final touch of completion we are here for any of your roof, siding, insulation, and gutter needs. 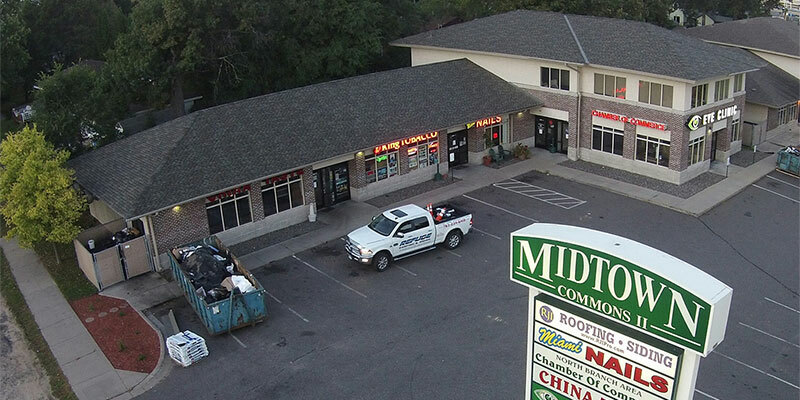 From banks, office buildings, strip malls to churches our experienced commercial contractors can fix it all. Licensed, experienced and trained we are the contractor you can trust. We offer a HASSLE FREE – NO OBLIGATION ESTIMATE and CONSULTATION! In most cases our initial estimate and consultation will not take us longer than 30 minutes. Shout out to Josh and his crew for taken care of my roof in the cold all day today. They work strenuously all day to save what we can on our house. Thx Josh and Julie for working with me in such a professional matter through this process that has been stressful enough as it is. They made it out same day and had an estimate within hours. 3 days later the job is complete. Highly recommend Refuge Roofing!! I would highly recommend Refuge, they showed up earlier than expected, worked steady from start to finish on removal of my ice dams. Do not wait to get this done, small price to pay to save many thousands of interior damage. We come home from vacation to a roof leak due to ice dams. We called Refuge Roofing & Siding to get some information as this has never happened to us before. Not only did they actually answer the phone, they were able to give me a time and quote right away for the removal. We scheduled and kept in communication until they were able to come out. The had excellent customer service and did great work. They were very professional and I would definitely recommend them for ice dam removal! I just had my roof replaced and worked with Seth. He help through the whole process and also came the day they were working on it to make sure everything was going good. They were really fast and all were super nice. I would recommend them to anyone. It was done within a few weeks of the storm that hit my area. Also they cleaned up everything and made it look like they were never here. They did a great job on our roof. Cleaned everything up as well, no need to worry about nails either. We recently had our gutters replaced. Estimate to completion was less than 10 days total. The crew was exceptionally polite and did an amazing job.I highly recommend this company! We worked with one of their contractors, Travis. He did a great job working directly with our insurance company to ensure we received everything we were owed. The house looks great! We highly recommend their services. We had new siding done on our home this past summer and were very pleased. Brian Christensen was very friendly and professional and communicated well throughout the entire process. The crew also cleaned up well after the job. Would highly recommend them!! Called and Josh, the owner, answered on the first ring! He was out to our home in no time and had 2 guys on our roof and it was fixed in a couple hours. He kept us informed the whole time!! Excellent communication and service! Josh and Travis were extremely knowledgeable. They worked for us until the final checks were disbursed. Great team, great roof and awesome customer service! We will be recommending them to all our friends/family looking for a positive roofing experience. Contacted the owner when in a bind to get a deck added to my house. He was able to get out the next day, got me a quote, and had the deck completed the following week! Will definitely use them again and we have already recommended them to co-workers. Wow! I usually don't take the time to write reviews because I usually see average work. Refuge Roofing has earned my endorsement and respect. From the initial meeting through the completed job, I was impressed by the communications, follow through and the quality of the work. The team was so respectful, and left our property in great shape. Even a second check the next day to make sure everything was perfect. The roof? Attention to detail all the way. They fixed areas to allow for better run off. They even painted the furnace vet and fireplace chimney so they fit in with the color scheme of the roof. If you want a truly great company to work with, Refuge will deliver! Brian did an amazing job on my home! From beginning to end he made the process seamless, efficient and stress free. Literally, Brian did all the worrying for me! He worked with my insurance agent and allowed me to get far better coverage than I would have hoped. He kept me well informed and got the work done quickly. My house looks amazing. I couldn't ask for more. I truly felt like I was working with a friend and ally. He was in my corner the whole time. Super impressed and he will be my first (and only) call the next time I need work completed. Refuge roofing did an excellent job on are roof! Highly recommended. Our roof got damaged during a recent storm. Refuge Roofing did an excellent job from start to finish. They made it such an easy process with insurance and the actual new roof being completed was fast and quality work. It looks great! I would highly recommend Refuge Roofing & Siding. Josh and Julie are great people to work with. They came out same day and I had an estimate within hours. 3day later and my ice dams are gone. They worked all day in the freezing cold nonstop until the job was done!! Thx Refuge Roofing for your fast, professional and top notch work!! Highly recommend Refuge Roofing!! We recently had Refuge out to do some repairs on our shop from a recent storm. Quick, Professional and Reasonable. Highly Recommended. Will use again when needed. I had a very good experience with Refuge Roofing & Siding for a new roof on a rental property. Owner Josh and his team were fast & professional, delivered straight-forward information, and installed a quality product. Great job! Fast professional service! The job was done prior to the anticipated finish date with no issues. Josh and his crew did an amazing job on our roof! He made us feel confident and comfortable with something we don't know a lot about. His advice on color choice for the shingle makes our house stand out in the neighborhood. We would definitely recommend Refuge Roofing & Siding to our friends and neighbors. Josh and his crew not only realize that your home is your castle, it is also the place you go to find REFUGE!